Dana Leong is a two-time Grammy award winning musician, composer, and producer. Considered by many to be the world’s top electric cellist, he has also been referred to as world’s top trombone player by members of the world renowned Balkan Beat Box. Dana’s music spans across multiple genres. His distinctive sound is an emotionally mesmerizing combination of jazz, healing music, electronic dance and hip hop. He has taught Jazz at Stanford University from the age of 16; won two Grammys in Latin Jazz for his collaboration with Paquito D’rivera; worked with Kanye West and Sean P. Diddy Combs in Hip-Hop, and with DJ A-Trak and DJ Qbert in EDM; been a guest musical director for Fela on Broadway; and has composed themes for international brands such as Hermès, Virgin Galactic, Porsche and Mont Blanc. A leading innovator at the intersection of music, technology and wellness, Dana has performed healing music at the World Economic Forum’s closing ceremonies and is a composer on a ‘musicians against violence’ album produced by Harry Belafonte. 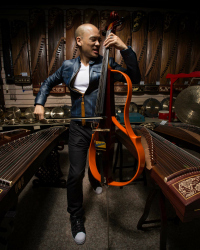 He also worked with Yamaha to consult on the design of the “Silent Cello”, serves as a U.S. Musical Ambassador and is a World Economic Forum Young Global Leader. Dana’s inventive presentations on music, technology, and creativity always draw the largest, most diverse crowds from our student body, who are eager to participate in his unique, innovative, and highly interactive sessions. He gives our students an exciting modern perspective on music that no other Visiting Artist can.